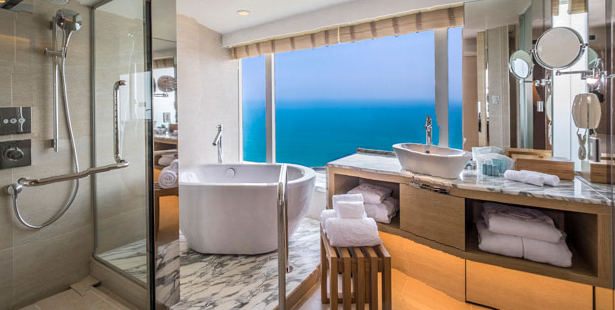 The luxurious hotel with ocean views admired by the world VIPs. The 45 storied prism shaped hotel, with a height of 154 meters, is loved by the world VIPs. It has a variety of room types such as Japanese and Western styles. The minimum size of a standard room is over 50㎡. From the whole 743 rooms, panoramic views of the Pacific Ocean and a long established golf courses can be seen. The room consists of Sheraton’s original beds that promise you to give an ultimate level of sleep. Enjoy experiencing the most luxurious resort life with international restaurants, hot springs, spa, etc. 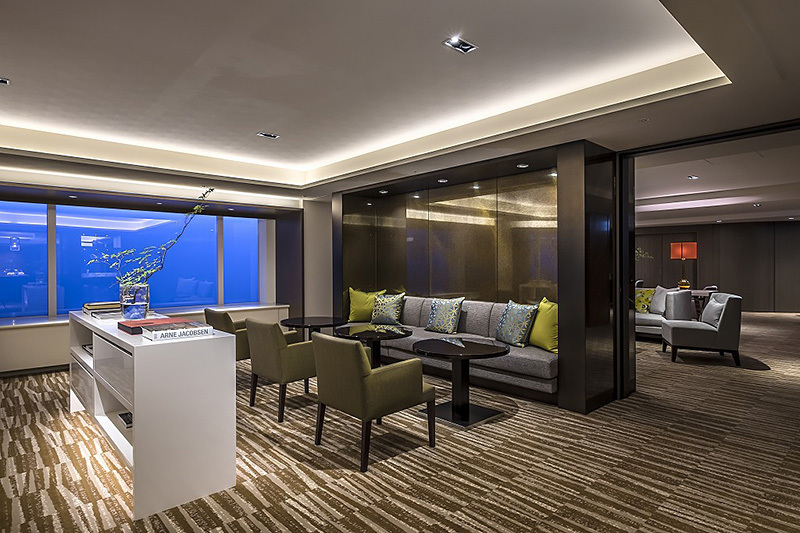 36th Floor Club Floor Lounge "Sheraton CLUB"
The premium category "Club Floor" upgraded to more than 36 floors that opened on August 1, 2016. 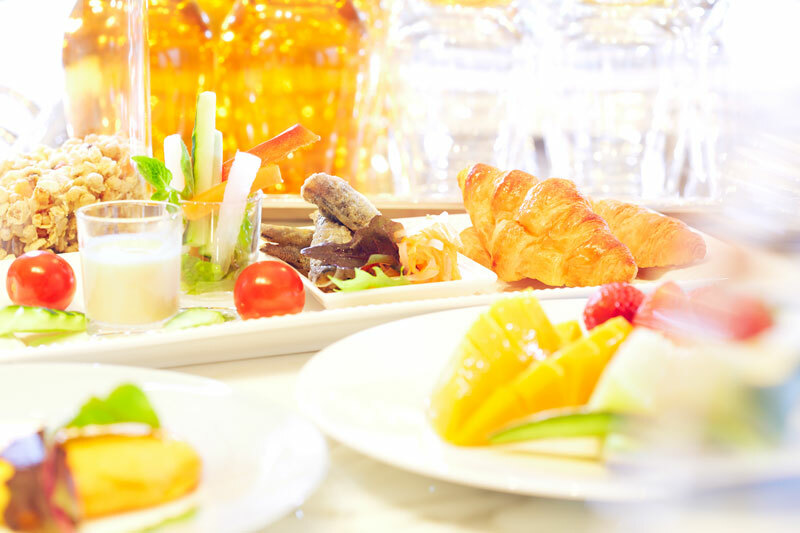 In the club floor lounge "Sheraton CLUB", full-time staff are on-site, check-in and check-out are possible, and from "breakfast to tea time, bar time" you can enjoy "food treasure trout Miyazaki" to your heart's content. 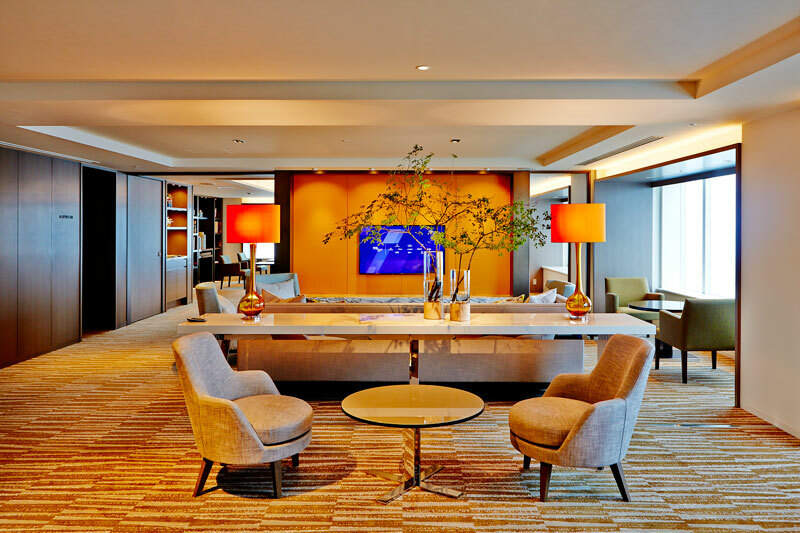 Located on the high floor above the 36th floor, it is a notch space above which you can feel the "fragrance" of sea, pine forest, flowers etc with high sensitivity. From the large window, while sitting on the rotary sofa, you can enjoy the blue Pacific Ocean and lush black pine forest from the view bath to your heart 's content. Stay confirmed 24 hours after check-in. From the breakfast to the bar time, you can use the 36th floor club lounge "Sheraton CLUB". Located on top of the prism shaped building, the Suite Rooms is the nearest to the ocean. The panoramic views of Hiyuga-nada from the rooms are the most beautiful. 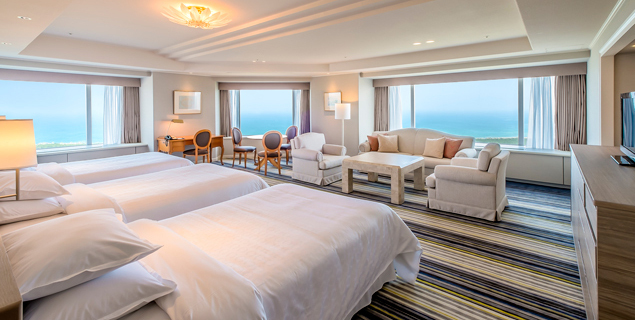 The spacious room with the breathtaking views will transform your family time even more precious. The room with a large floor area has a view of the Pacific Ocean. 16 – 35F Deluxe Floor: The glass wall between the bathroom and bedroom lets in natural sunlight and creates feeling of space. The new set of interior creates fine living space. 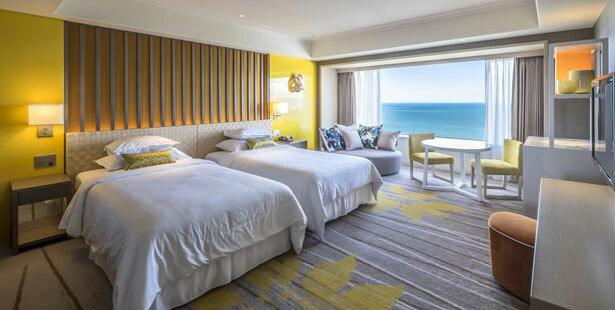 Relax in a spacious room with an ocean view. 8 – 15F Standard Floor: Range of guestrooms to suite every guest’s need: relaxing by yourself or with someone special, having fun with your families and friends. Sheraton signature bed, Sheraton's original bed created in pursuit of a comfortable night's sleep. The bed is created with a multiple number of a 30cm-thick mattress and high coils. The specially designed bed is designed by Sealy Co., Ltd, the No. 1 bedding company in the US. Regardless of a body shape and weight of a user, the bed supports the back bones adequately, which provides a comfortableness like being wrapped in a swing basket. Other features are soft textured Duvet (feather quilt) and a feather pillow, well ironed cotton sheets, which will lead the guests to an ultimate sleeping experience. The concierge staff is the best person to ask about the hotel and sightseeing. Please do not hesitate to ask us about any big or small questions regarding from your hotel life to sightseeing plans. Our experienced qualified staff looks after your children aged between 56 days old to the grade 6 of an elementary school. You can relax and enjoy your hotel life for a while. Business hours / when an arrangement can be done. [Reservation] by 17:00 two days prior to a scheduled day. Please fill in the areas required. Place your seal before sending it by fax, post or dropping it in to the activity center by 17:00 a day before a scheduled day. The agreement form for the baby sitter room is also required. * Please call us in advance to check the condition of reservations. * Reservation is essential to be made by 17:00 two days prior a scheduled day. * Cancellation fee: A cancellation fee will be waived when we are informed by 20:00 two days before a scheduled day. * Cancellations made after 20:00 two days before a scheduled day will incur a 50% cancellation fee. Cancellations made after 17:00 one day before a scheduled day will incur a full amount. Various restaurants that offer cuisines made with Miyazaki ingredients including local chicken and Miyazaki beef. Shops have a lineup of original goods. The complete scape equips state of art training machines, aerobics studios, a 25-meter indoor pool.